With the defeat of the Burning Legion behind us, our eyes turn to Darnassus to kick off the growing tension between the Horde and the Alliance. Unlock allies to assist in the war effort to gain victory over our enemies. The final installment of Legion took us to Argus, home base of the Burning Legion. There we met the Broken and Grand Army of the Light survivors of the shattered Draenei home planet. We also reunited with Alleria and Turalyon, long thought lost with the closing of the Dark Portal. Together we put an end to Sargeras and the Burning Legion—at a terrible price. Sargeras’s final blow to the denizens of Azeroth was to plunge his sword deep into the center of Silithus. To quell the poisoning of the planet, we sacrificed the power of our Artifact Weapons, rendering them powerless, mere shadows of their former selves. Battle for Azeroth comes with the introduction of Allied Races that are eager to join the battle. The Alliance gains the Lightforged Draenei and Void Elves, and the Horde are bolstered by the Nightborne and Highmountain Tauren. All four races are currently available if you pre-order the expansion. As a bonus, if you level an Allied Race character from their beginning level of 20, to level 110, you unlock a unique heritage armor appearance befitting the aesthetic of that particular race. Conflict between the Alliance and Horde has always simmered just beneath the surface, but was constantly pushed aside when greater threats arose. Now, with the Burning Legion defeated, concern over possession of a new, rich resource—Azerite—becomes the focus of attention. Neither faction trusts the other with control of this powerful substance, and efforts to both collect, and prevent collection, become heated. The most recent World of Warcraft novel—Before the Storm by Christie Golden—gives light to the mounting conflict you can experience first hand during the 8.0 pre-patch story, War of the Thorns. 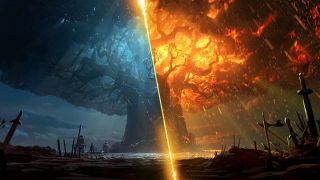 You can witness the burning of Teldrassil, as shown in the second Warbringers animated short. The first short Warbringers short featured Jaina Proudmoore. Having disappeared at the beginning of World of Warcraft: Legion—after the events at the Broken Shore—we see her ready to sail back to her home of Kul Tiras, determined to face her regrets and fight to win back her people. The third short features Queen Azshara, a major character who has never made more than a brief appearance in World of Warcraft before Battle for Azeroth. We will see plenty more of her over the course of the expansion. World of Warcraft: Battle for Azeroth releases for Windows and macOS on August 14, 2018.